I have indeed taken a break from writing lately. My whole family has been busy helping my mother get ready to sell her house in Millburn, New Jersey. For several years now, she and I have been traveling from Massachusetts (my home) to New Jersey (her home) to Virginia (my brother’s home) and then back to New Jersey and so on. Frankly, living in three places has been exhausting and confusing for me, let alone the almost 92-year-old Jan! So this spring she decided to put the New Jersey house on the market. She and I spent a couple of weeks at the house (known as Daffodil Cottage) in June de-cluttering and making sure that all the little repair jobs we had been saving up got done. We then turned the place over to our realtor, the amazing Wendy Drucker. Recently, my friend Peter asked me for advice about choosing a realtor. I sent him a long letter, and OF COURSE I can’t find it now. The gist of it was that the ideal realtor understands the unique features of one’s home and looks not just for the most money but also for the best fit for the house and its owner. I also suggested that the best realtors were rooted in the communities in which they sold property. Peter told me I was brilliant. Well, of course, I am—but my description of the ideal realtor had nothing to do with my brilliance and everything to do with Wendy’s. She is cheerful, knowledgeable, and competent—and she cares about my mother, me, and the past and future of Daffodil Cottage. 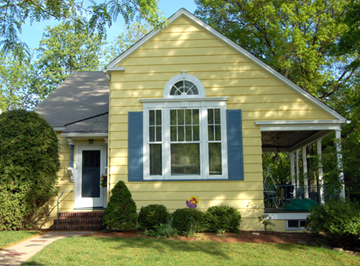 She has found a buyer who wants to bring up his children in Daffodil Cottage. The closing will take place next week! Whenever we have been in a jam—locating a repairman while out of state, trying to figure out how to get rid of decades’ worth of garbage, looking for a real-estate lawyer who would reassure my mother that selling the house was indeed the right thing to do—Wendy has come through. She and her terrific husband Chris have spent more time in Daffodil Cottage lately than we have. 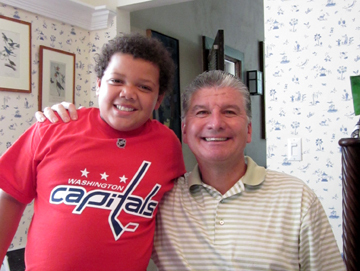 Chris and my nephew Michael bonded when Chris stopped by to help my brother David install a fire extinguisher in the kitchen. What with all the sorting and packing, we haven’t had much time for cooking. We have eaten some yummy takeout, about which I’ll write soon. But we did invite Wendy and Chris over last week for a quick pasta supper. We served the simple sauce below over whole-wheat rigatoni purchased at one of Millburn’s best places to shop, Mia Famiglia. This little Italian deli sells tasty sandwiches and soups, aged Italian cheeses, and crusty breads. 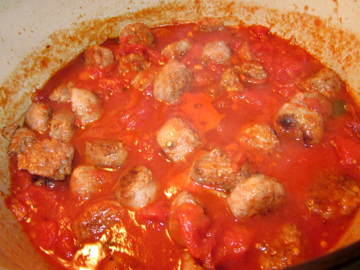 Naturally, we prepared the sauce with Mia Famiglia’s own sausage, which is flavored with tons of fennel. If you can’t shop there (we won’t be able to soon! ), you may make it with any Italian sausage you like (I’d mix hot and sweet if you don’t have the natural spiciness we enjoyed)—even vegetarian faux sausage. Jan and I will be embarking on more adventures in real-estate soon: another experienced realtor, Carol Cooke, is looking for an apartment for us in Virginia. In the meantime, here is the sauce we served to Wendy and Chris. You don’t actually have to sell real estate to enjoy it. In a frying pan brown the sausage chunks, using oil if they are made of soy or are very lean. Drain and set aside. In another large frying pan or a Dutch oven sauté the garlic in the olive oil just until it turns golden brown. Add the tomatoes, salt, peppers, oregano, and sausage. Cook this mixture down for at least 20 minutes, uncovered. Stir occasionally. The sausage gets richer and denser if you simmer it for up to an hour; if you want to extend the cooking, make sure you cover the sauce almost all the way after it begins to thicken. Toss in the basil just before serving over pasta. Top with grated, aged Romano cheese from Mia Famiglia. Serves 4. 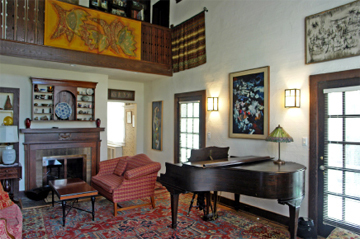 Goodbye, arts-and-crafts living room of Daffodil Cottage! This entry was posted on Monday, August 9th, 2010 at 4:00 am	and is filed under My Family, Pasta and Pizza. You can follow any responses to this entry through the RSS 2.0 feed. You can leave a response, or trackback from your own site. What a beautiful home (and sauce:) Welcome back…I hope things go back to normal for you soon! Big doings; you’d never suspect that room from the exterior street view of Daffodil Cottage! I hope the transition is as smooth as glass. Thank you ALL for the good wishes! We are optimistic even if we will miss this very cute house.